HSBC Amanah has a new credit card promotion where MPower Visa Platinum Credit Card-i card holders will earn up to 6% cash back on petrol and groceries spending. On top of that card holders also will earn 1% cash rebate on all retail overseas spending and 0.5% on other other retail spending. This promotion is valid from 7th July 2011 to 31st December 2011. All MPower Visa Platinum Credit Card-i card holders are eligible. No registration is required. 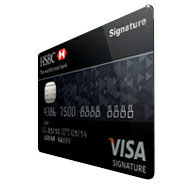 Recently, HSBC Malaysia upgraded their VISA Platinum to VISA Signature Credit Card. All existing VISA Platinum card holders will be automatically upgraded to VISA Signature. In conjunction with the the new VISA Signature launching, HSBC rewards 5 times more points for every RM spend at selected shopping malls, departmental stores, groceries and overseas usage on hotel & dining during the programme period. Below are the details on the selected shopping malls, departmental stores, groceries. Yesterday, we look at conventional fixed deposit rate for September 2010. However, if you prefer to deposit in Islamic Fixed Deposit Account or commonly known as General Investment Account (GIA-i) instead of conventional fixed deposit account, the rates are shown in the table below. Kindly note that, the rate showed in the table below are only indicative. It means that, the rates may changes according to agreed profit sharing ratio. Alternatively you may want to look at this page.